Sushi University is a website that’ll familiarize you with the various facts and facets of sushi. Sushi University is an in-person sushi experience in Tokyo, Japan. From the moment you land on the home page of this site, you’ve got fabulous sushi info — about rice, fish, and toppings —in front of you. Bookmark this home page on your phone so you have it handy when you’re in any sushi restaurant. Click any item there or move down and choose the Basic Sushi Knowledge page. Then be sure to see everything under the Sushi Visual Dictionary menu. or with Japanese hosts, or for any other reason, a visit to this site will serve you well. Basic Sushi Knowledge — from etiquette (sushi manners) to well, anything else sushi. Their fact-filled blog — did you know there’s an order for eating sushi? Be sure to click each archive date. Sushi University Courses — If you’re traveling to Tokyo, you might love one of the three offered dining experiences. 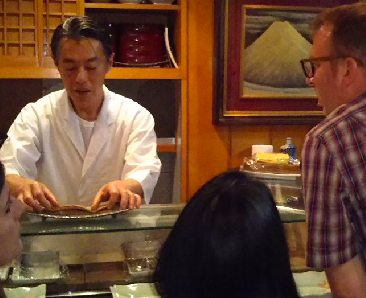 You’ll get to sit with an interpreter at the counter of a true Japanese sushi bar and learn about Edo-style sushi from the sushi chef as you dine. As I write this, the “courses” start at ¥12,000 per person and includes around 14 Nigiri Sushi and some kind of Maki Sushi. I’ve loved sushi since I was a young professional living in NYC and learned some things as I went along in life, but I learned much more in a short while on this site. I’ll definitely be reading it again before I get back to Japan. I got lost in this site — and got pretty hungry. But the coolest takeaway for me is that now I finally know whether it’s ok to eat sushi with my hands as I prefer, although I mastered chopsticks decades ago before my major travels began.